My life was ruled by the television when I was a child. Thankfully, till I was around 10 there weren’t any satellite channels available and there was nothing like cable television. I loved watching movies, and a few shows on TV. I have always been an above average student, very good in extra-curricular activities and loved reading books as well… So no one really complained at home. My parents were happy till the time I was getting nice grades and piles of certificates for debates, dramatics and dance. I was happy as I was allowed to choose what I wanted to do in my spare time. Now I realise, I missed out on a lot of things. I didn’t take out much time for friends, outdoor activities and socialising. When I was not doing anything related to school or reading a book, I was only watching TV. As I realised this, I make sure Zoe has lots of things to choose from when she gets bored. TV should be one of the options but not the only one. This needed a lot of hard work, not on Zoe’s part but on mine. Being a TV Junkie and a movie buff, I had to bring down my time in front of the screen to a minimal. It was not easy, but once I take a decision, I generally stick to it. The next challenge was convincing the husband. His parenting approach is ‘let the child be…’ and I have no problem with that. We never stopped Zoe from watching TV, rather we limited our TV time. Now for my 2.5 year old, TV means an hour of Barney in the morning besides a couple of minutes of what mamma watches in the evening. A couple of days back, I wasn’t sure if what I was doing was right. Then it struck me, when one day Zoe missed her afternoon nap and sat beside me while I was watching a movie. She watched the movie with me for about 10 minutes. Then she got off the couch picked her books and started reading to herself (she obviously doesn’t read yet, she mimics her parents). It was then I realised that this always happens. If we are watching anything which is not of her interest she does not sit in front of the TV for long. So, I was right in what I was doing. I just need to go on like this and Zoe will hopefully have more things she can do in her spare time. I really don’t know if this approach works for everyone, like it worked for me. Do you have a better idea to keep the TV time limited? Am I being too harsh because eventually it should be her decision to do what she wants… Isn’t it? 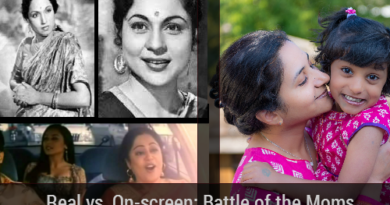 Real v/s On-screen: Battle of the Mommies!